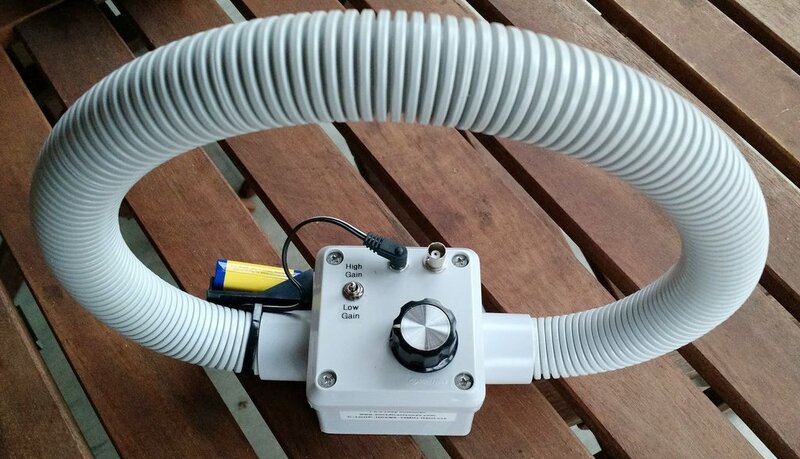 Over the past year, a number of SWLing Post readers have asked me to review the PK Loop portable magnetic loop antenna produced by Paul Karlstrand in Australia. I finally caved in and purchased one. I ordered the shortwave version of the loop, the C-LOOP-HDSW6-18 in early November and received it about one week later. The Sony SW100 tuned to WBCQ. I was first introduced to this antenna by SWLing Post contributor, Mark Fahey, who brought it to the SWL Fest and our 2015 PARI DXpedition. 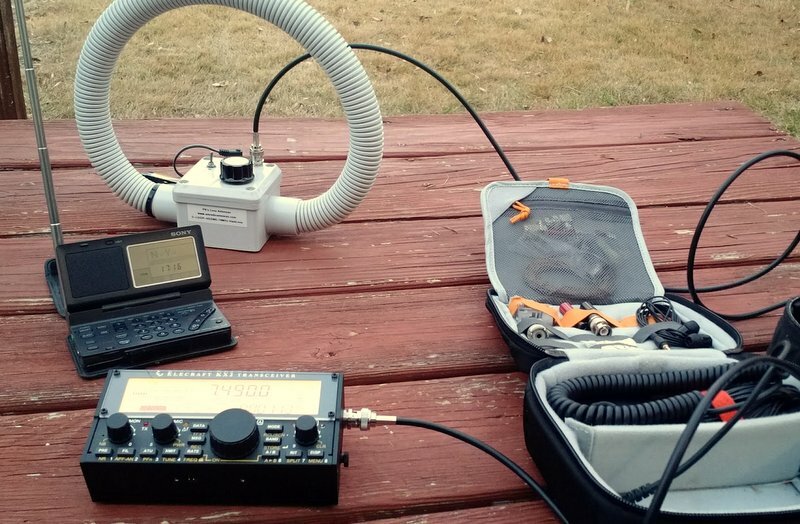 Mark has taken his PK Loops (both the shortwave and mediumwave models) on his numerous travels around the world. He finds that they’re relatively effective portable antennas in RFI-dense environments like hotels and guest houses. They’re better at mitigating RFI than, say, portable wire antennas or telescopic whips. Mark hooks up his portable SDR to the PK Loop and makes spectrum recordings (wideband recordings)–from, say, his hotel room in Kuala Lumpur–then takes the recording back home to listen and tune at his leisure via his laptop or tablet PC. While I’ve certainly made spectrum recordings while travelling in the past, the appeal of such a portable loop antenna is what finally caused me to pull the trigger. 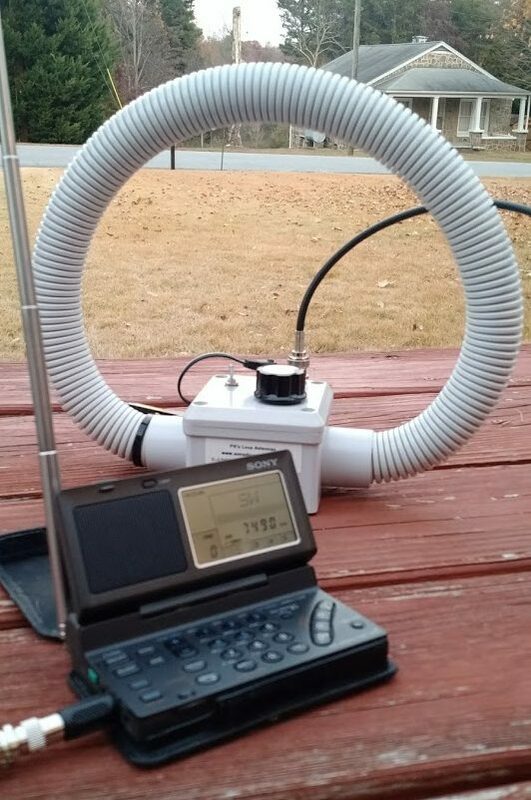 The PK Loop is a small loop antenna–measuring about 12″ in diameter. It’s encased in UV-stabilized PVC conduit and the matching box also seems to be made of PVC. It feels very durable and can, no doubt, even survive the wildest of luggage handling. The PK Loop has an attached battery 9V battery holder, but can actually be powered by any 9-18 volt DC supply. Current consumption is less than 15 mA. On the matching box, you’ll find a tuning knob, a BNC connector, DC power in port and a HI/LOW gain switch. My loop shipped with a 2 meter BNC-BNC Cable, 3.5mm adapter, and DC Power lead to open ends. Loop antennas, in general, are fairly narrow-band and–unlike a Wellbrook or Pixel Loop–manual adjustments need to be made with the tuning knob to match the PK Loop as you scan across bands. Still, I see why Mark favors the PK Loop for spectrum recordings: the bandwidth is wide enough that if I tune the loop to the middle of the 31 meter band, for example, it does a fine job covering the entire band. My free time has been very limited since receiving the PK Loop earlier this month, but over Thanksgiving holiday, I took it to my family’s home that has relatively high RFI levels. The following are a couple of videos I made with my Moto X smartphone. I’ll be the first to admit that these are not the best videos–I had no tripod and the Moto’s microphone leaves much to be desired–but I think you’ll still get the idea of how well the PK Loop works. So far, I’m very pleased with the PK Loop. It does seem to mitigate noise better than other portable antennas I’ve used in the past and certainly improves my SW100’s reception. It makes SWLing with the Elecraft KX2 or KX3 easy and convenient. One word of caution: if you use the PK Loop with a transceiver like the KX2, please turn off the ATU, and set the power level to 0W before using. The PK Loop is receive-only and will not handle any RF power. Note that with the SW100, I have only used the PK Loop’s low gain setting. I’m a little nervous about overloading the SW100, so do not plan to use the high gain setting. The Elecraft KX2 seems happy to handle either gain setting: I imagine this will be the case with most general coverage transceivers and tabletop receivers. In a couple of weeks, I’ll be staying in a hotel room (likely with inoperable windows and heavy RFI) so I will attempt to put the loop through its paces and compare it with my radio’s built-in antenna. Stay tuned! UPDATE: Click here to read my follow-up review. Post readers: have you used the PK Loop or other similar portable/travel antennas? Please comment! Click here to view PK’s Loop antennas on Paul Karlstrand’s website. Paul also sells his antennas and ships internationally on eBay–click here to view the selection. 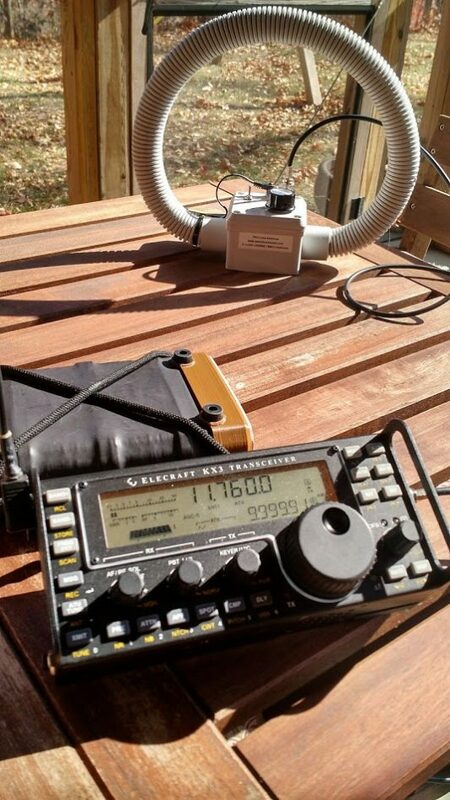 This entry was posted in Accessories, Antennas, News, Portable Radio, Radios, Reviews, Shortwave Radio, Travel and tagged Elecraft KX2, Mag Loop Antennas, Magnetic Loop Antennas, Mark Fahey, PK Loop, PK Loop C-LOOP-HDSW6-18, Sony SW100 on November 30, 2016 by Thomas. A wonderful match of form and function. I’ve never needed to use anything other than the lo-gain to get more-or-less perfect reception on signals picked up on my PL 660 in a low RFI environment. I’m looking forward to taking it on holiday to try it when interference is higher. I have used one of Paul’s passive 14 inch loops on longwave for years. to log and record France Inter on 162 khz! Paul makes a great product and is a fine gentleman to deal with. Very prompt shipping via airmail from Melboure,too. Yes indeed and great to hear about the LW loop, Ron! Yes, he’s a nice guy and seems to make a quality product. No doubt fine-tuned over the years! Can anyone with experience give a comparison between this loop and the indoor one that AOR sells? My next big purchase, once I get out of debt from my last big purchases, is going to be a good active antenna. Just want to know all of my options. I’d love to read such a comparison, too! That AOR seems like a great antenna, but it is pricey. Thank you Thomas, I’m looking forward to Part II. I looked at this loop several weeks (maybe two months?) ago, and I exchanged emails with the builder. I instead went with the DoxyTronics 8020CA. The PK loop is by far a better choice for traveling. My international travel days are over as is my regular stateside travel. But it’s still on my radar 🙂 I cannot resist cool new toys! It sounds like the DoxyTronics serves you well, Troy. In truth, the real test will be a hotel room. That the one place where I’m surrounded by RFI and rarely have the option to put an antenna outside. Even if it helps a little, I’ll be happy.